Heat oven to 375°F. Spray 13x9-inch pan with cooking spray. Scatter peach slices evenly in pan. Sprinkle granulated sugar, cornstarch, 1/2 teaspoon cinnamon and the lemon juice evenly over top; stir to combine. Top evenly with 3 tablespoons cubed butter. In 1-quart saucepan, heat 1/2 cup butter over medium heat 8 to 10 minutes, stirring frequently, until light golden brown. Pour into large bowl. Stir cookie mix, 1/2 teaspoon cinnamon and the egg into browned butter with wooden spoon until soft dough forms. Spoon dough in tablespoons evenly over top of peach mixture; sprinkle with sparkling sugar. Swap frozen peaches for pitted, peeled and sliced fresh peaches, if desired. 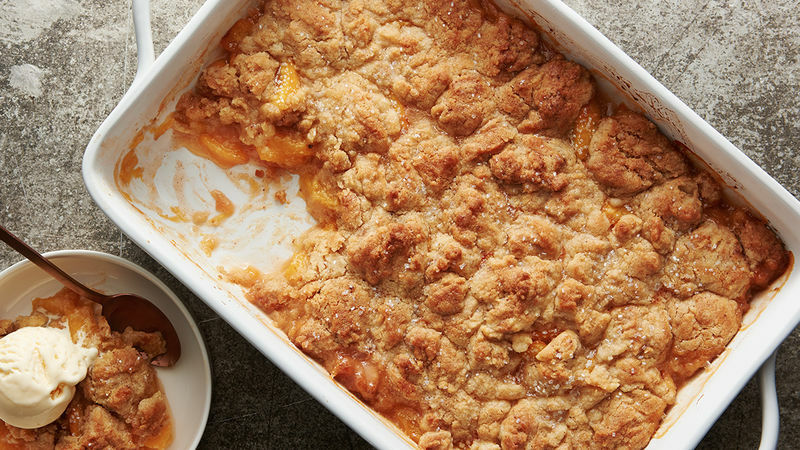 This peach cobbler recipe is a runaway hit! Peach cobbler is already amazing, but add a sugar cookie crust—with brown butter, no less—and it’s even better. The best part: the sugar cookie topping is made from a mix, so you’ll get maximum compliments for minimum effort.